The US Men's Team finished fourth in a tough field behind champion China, Russia, and Japan. Our own Yul Muldauer and the OTC's Sam Mikulak both competed all-around in the team final. Sam finished 5th in the All-Around file and Yul took 12th. In event finals Yul finished 4th and Sam 7th on FX; Sam 4th on PH; Sam 4th on PB; and Sam won the BRONZE on HB. 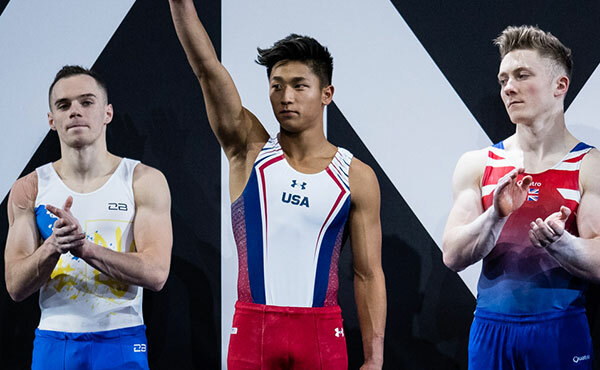 The USA Men's team for the 2018 World Championships is led by our very own Yul Muldauer (Oklahoma University) and USOTC resident athlete Sam Mikulak (University of Michigan). Accumpanying them will be Akash Modi (Stanford University), Colin VanWicklen (Oklahoma University / Cypress Gymnastics), and Alec Yoder (Ohio State University). Allan Bower (oklahoma University will travel as the alternate. 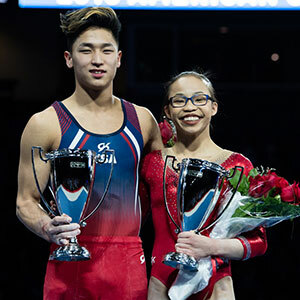 Yul Moldauer won his second American Cup Championship today ahead of Kenzo Shirai and athletes from several other world gymnastics powers. The American Cup is one of four World All-Around Cup competitions. These four meets, along with the World Challenge Cup competitions, qualifiers (for at-large individual spots) for the 2020 Tokyo Olympics. Congratulations Yul, Vladimir Artemev, and the entire Colorado gymnastics community. As expected, Region 3 (Texas, Oklahoma, Louisiana, Kansas, Missouri, and Arkansas) took 1st place over Region 1 (California, Arizona, Nevada, and Hawaii) and Region 6 (Massachusetts, Connecticut, New Hampshire, Rhode Island, Vermont, and Maine). 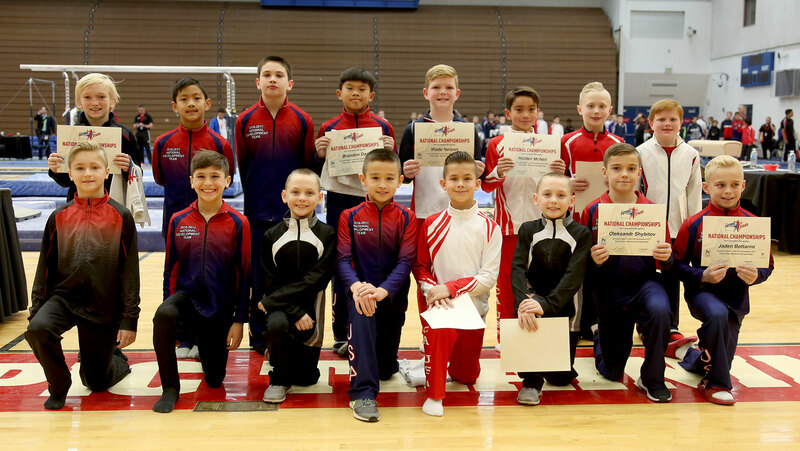 Region 9 defeated powerful Region 5 (Illinois, Ohio, Michigan, Indiana, and Kentucky) behind athletes from 5280 Gymnastics and USA Gymnastics World. Let's keep building up the team. The Regional Allotment numbers have been finalized. The boys must place in these numbers at State Championships or receive an approved petition in order to compete at Regionals. Entry fees ($135 per gymnast, $160 for JE gymnast) for Regional Championships will be due at the end of each level's State Championships with one check per gym and one entry form. All level 6-10 due on the 18th of March, and level 5 due on the 25th. Regional Packet with entry form, petition form and tentative schedule coming soon! Good luck to everyone at State Championships and see you all there! I hope everyone's season is going well! Encourage the seniors on your team to come be a part of the AAI High School Gymnastics National Championship. Please pass this information along to all of the coaches in your state and region. We have also created a website for the meet for everyone to get details and updates. Click here to view the website. If you have any questions, let me know! Anyone with graduating seniors, please send me their information as soon as possible. I would like to have their name, level, and their future college plans. Each athlete will be recognized at the state meet! Region 9 is hosting a camp/clinic that is open to all current level 6 and above athletes in the region. The parents will register and pay directly through the parent portal on the Xtreme Altitude website, so clubs do not have to collect payments or waivers. Spots are limited so please send out the information to your parents now! We will have more details as it gets closer! This is reminder that all entries for the state meets are due on Feb. 1st through the USAGym website. After Feb. 1st no entries and/or level changes will be allowed! Everyone should have received emails for both the level 4/5 meet (from Erik at A+) and the level 6-10, JD (from Laura at Xtreme). If you didn't receive this information, please let me know!! Let me know if you have any questions. Good luck to all of the boys at the state championships! Jim and Beth have been unending supporters of Colorado gymnastics for decades. Jim will be missed. Coaches, GET USA GYMNASTICS COURSE CREDIT! Region 9 will be hosting a Regional Clinic along with the Future Stars Testing October 14th at Xtreme Altitude Gymnastics in Lafayette, CO. If you attend the Regional Clinic you can receive USA Gymnastics University course M310 credit! Clinicians are Dave Juszczyk and Jon Portillo. Dave will be going over Floor presentation and Basic circles on Pommel Horse, and Jon will be covering Vault run and approach as well as P-Bar basics. The Future Stars participants will be the only athletes in the clinic, but all coaches are welcome and encouraged to attend. Topics will be beneficial to all levels, not just Future Stars. This clinic is FREE to all coaches! Hope to see you there. 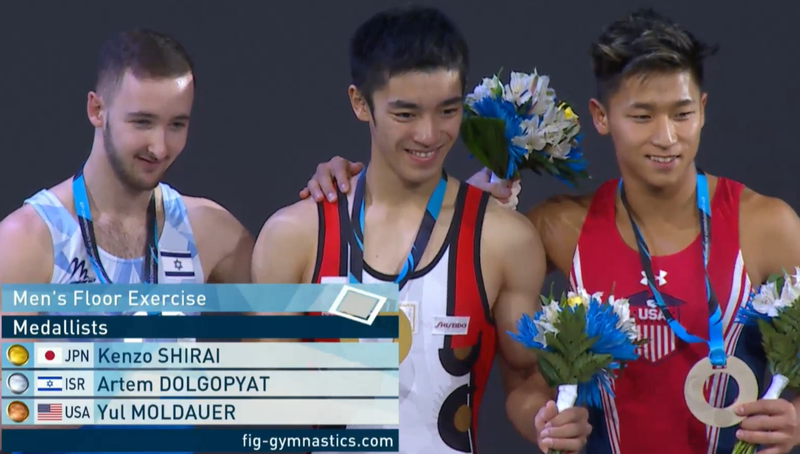 Yul Moldauer finished with the highest exectuion score in the floor exercise final capturing the bronze medal ahead of several athletes with higher start values. Congratulations Yul, Vladimir Artemev, and the entire Colorado gymnastics community. Yes, we're all claiming Yul as ours. Yul Moldauer finish in 7th place in the All Around at his first World Championship in Montreal tonight. Congratulations Yul, Vladimir Artemev, and the entire Colorado gymnastics community. I just wanted to send a reminder to everyone about the State Future Stars Testing this Saturday at Xtreme Altitude. Warm up begins at 9:00am. Also, our Colorado State Coaches Workshop will be held after the testing is finished at approximately 1:00pm. I just found out that I am able to register the course through USAGymnastics so all who attend will get course credit through the University. The Board has unanimously voted for A+ Athletics to host the level 4/5 state meet on March 24, 2018 and Xtreme Altitude to host the level 6-10, JD state meet on March 17-18, 2018. USA Gymnastics has assigned Yul Moldauer to compete in his first World Championship in October 2017 in Montreal Canada. With the World Championships in North America, this would be a unique opportunity to cheer on Team USA and our own Yul Moldauer. If you can make it to World Championships, please join Shaw Moldauer in cheering Yul on. State Chairman Nate Ragland has announced this year’s State Future Stars Clinic and Coaches’ Workshop. The event will be on September 23, 2017, starting at 9:00am, with the coaches’ workshop beginning at 1:00pm at Xtreme Altitude Gymnastics. State Future Stars in coming up quickly! Please see the attachment for the entry form (in MS Word), (PDF). Please fill out the entry form (make sure to include t-shirt sizes!) and mail that back with a gym check for $75/athlete made out to CO Men's Gymnastics. No parent checks!! No entries will be accepted after Sept. 6th at 5pm. I also need everyone to register their boys and coaches through the USAGym website - sanction #64187. Future Stars testing will start at 9am and will be followed by the Coaches Workshop at approximately 1pm. Please send suggestions for topics that you would like to discuss to me! Any questions, let me know! This is the single best USAG program to help you produce excellent gymnasts. Every current national team member started in the Future Stars Program. Even if you don’t think you’ve got potential national team members, participation in Future Stars will greatly improve your athletes’ gymnastics. YUL MOLDAUER IS NATIONAL CHAMPION !!! 5280's own Yul Moldauer has won the 2017 USAG Championship by 1.0 over his University of Oklamhoma teammate Allan Bower from Arizona. Taking the Bronze was the USOTC's Donnell Whittenburg. We can expect that Yul's next competition will be the World Championships in Montreal. See Yul's routines here. Xtreme Altitude's Jordan Valdez, now competing for the the University of Minnesota as an assistant coach, finished 4th on parallel bars and 7th on high bar. Yul tied for the gold on floor exercise with the USOTC's Eddie Penev. Eddie also tied for the gold on vault with Donnell. In the Junior Division (17-18 yo), 5280's Vitaliy Guimares won the Silver in the all-around to Georgia's Brody Malone. Vitaliy is national champion on vault and won silver medals FX and HB and bronze medals on PH and SR.
Colorado and Region 9 had one athlete in the junior division at the 2017 P&G Championships who did very well. With bobbles on pommel horse and parallel bars, Vitaliy Guimaraes of 5280 Gymnastics sits in 2nd place after Day 1. Vitali is within striking distance of leader Brody Malone from Cartersville Twisters (Georgia, Region 8). Yul Moldauer of 5280 Gymnastics continues his march toward worldwide victory. After winning the NCAA all-around title as a freshman in 2016 and the American Cup in 2017, Yul sits in 1st place after Day 1. Yul continues to dominate in execution. He had the highest execution scores of the day on three events while maintaining a high level of difficulty. Jordan Valdez who trained at Xtreme Altitude Gymnastics and was NCAA Champion on high bar for the University of Illinois had a mixed day. He competed only on parallel bars and high bar. Jordan’s high bar routine was very well done, but contained a fall, so he’s in 21st place after Day 1. Jordan made up for his high bar routine with an excellent parallel bar routine. Jordan is in 4th place on PB. Even more important for Jordan, he has taken a job as an assistant coach at the University of Minnesota, thus he competed in the burgandy and gold of UM. Our brethren at the Olympic Training Center are doing well, as expected. Donnell Whittenburg sits in 4th place in the all-around and 1st place on Still Rings. Eddie Penev is in 2nd on both floor exercise and vault. Sam Mikulak continues to come back from his devastating achilles tear at Winter Cup, so he only competed on pommel horse and high bar. He is in 3rd place on pommel horse and, despite a -0.5 deduction for using an extra mat to protect his ankle, Sam is in 2nd place on high bar. Donothan Bailey is in 6th place in the all-around and 2nd on pommel horse. New resident at the Training Center, Kanji Oyama is in 8th place in the all-around. Another new resident at the Training Center, Adrian De Los Angeles is in 10th place on vault. Adrian only competed on five events. Young Cameron Bock is in 18th place in the all-around. Men's P&G Championships continues tomorrow (August 19,2017). The juniors will compete at 1:00 pm MST and the seniors will compete at 6:00 pm MST. P&G Championships. The competition can be streamed at P&G Championships stream. If you miss a routine, USAG promises to post every routine at USAG YouTube Channel. for his selection to a 2nd term as a JO National Apparatus Leader. Jon will be the national head judge on parallel bars for 2018 and 2019. Jon has been the national head judge on vault for the 2016 and 2017 seasons and has done a great job. A 2nd term as a JONAL is quite an honor and requires a great deal of work. Just a note from the women's program . . . Colorado's own Alyona Shchennikova won the US Classic (Women's Qualifier for P&G Championships) last weekend. I believe she is coached by her father Alex Shcennikov. a gymnast receives value for a repeated single skill (highest value skill) as long as the skill is performed once or twice in a single connection (both receive value). Pass 2: Run – Tuck front Athlete recives value the two Tuck fronts in pass 1, but not the Tuck front in pass 2. Pass 2: Run – Front 1/1 Athlete receives value fo the Front 1/1 in pass 1, but not for the Front 1/1 in pass 2. Pass 2: Run – Front 1/1 – Tuck front Athlete receives value for both Front 1/1(s). He receives value for the Front Tuck in the pass 1, but not the Tuck Front in pass 2. Pass 2: Run – Front 1/1 – Front 3/2 Athlete receives value for both Front 1/1(s). Judging at the Qualifier was a thrill as always. We got to see some very good routines along with some interesting misses. There was a nice crowd for the Senior session. Thanks to everyone who attended. USAG has posted only the 20 points program standings for the Senior Division. Marvin Kimble (Wisconsin) won the Senior division with a score of 83.55. Marvin had a couple of misses, but looks sharp. He’s making hard skills look way too easy. Jordan Valdez from Louisville qualified to P&G Championships. He did very nice high bar routine, but fell on his dismount. Colin Wingrove from Alpine Utah competed but left with an injury. Fortunately, it looks like he just needs some therapy. 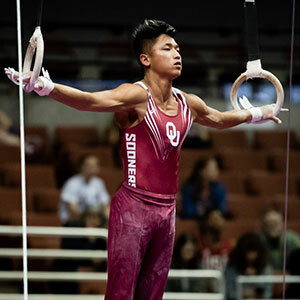 Yul Moldauer is pre-qualified and competed recently in Portugal so he took a break and stayed at OU to continue preparing for Championships. As for our brethren at the Olympic Training Center. They are pre-qualified or qualified from Saturday’s competition: Cameron Bock, Kanji Oyama, Donothan Bailey, Eddie Penev, Adrian de los Angeles, Donnell Whittenburg, and Sam Mikulak. It looks like the OTC, with Andriy Stepanchenko as head coach, has built up a nice team again. The qualifier to the 2017 USA (P&G) Championships in Anahiem California will be held at the USOTC on July 15, 2017. Several Region 9 athletes are likely to compete in the qualifier, including Winter Cup Champion Yul Moldauer. Many of the very best gymnasts in the United States compete at the annual qualifier just so they can be judged by the best judges in the US. There will be two sessions, the first starting at 12:30 pm, the second at 6:00 pm. The first session is junior and the second session is senior athletes. Information. Please support this competition staring some of the best athletes in the United States. I think entry is free, so this is a great opportunity to see how the best gymnastics is done. HOW DID REGION 9 DO AT JO NATIONALS? USAG JO Nationals were held in Kissimmee Florida at the beginning of May, 2017. Here’s a quick recap of results. Athletes in the Junior Elite Division compete both an optional routine and a very technically judged compulsory. An athlete desiring to qualify to the USA National Team must compete in the JE Division. Athletes in the Junior Olympic Division compete two optional routines. 11 year olds cannot compete at JO Nationals in the JO Division.